For Seattle Opera's next production, audiences will dive deep into famous poet E.T.A. Hoffmann’s colorful world -- but it doesn't stop at the stage! 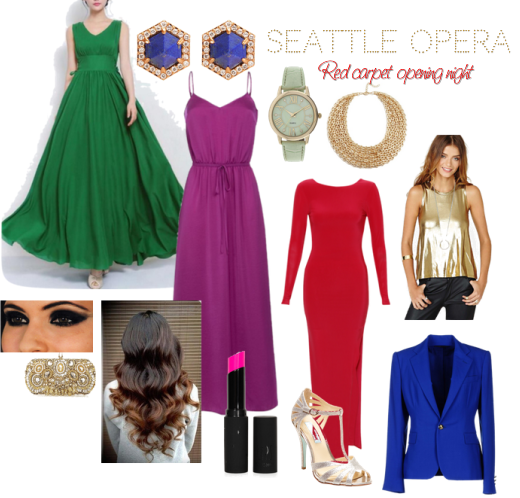 We hope you'll join us for The Red Carpet Opening Night of The Tales of Hoffmann; come dressed to impress in a palette inspired by the opera itself. In the spirit of our stylish production, please wear your most colorful attire. For inspiration, take a cue from Costume Designer Marie-Therese Cramer's bold, jewel-toned creations in magenta, emerald and lime green, candy-apple-red, and shimmering gold. Let your clothes be as vivid as your imagination! Check out what everyone’s wearing before the show and during intermission, and enjoy Offenbach's fantastical story of one poet’s romantic misadventures and the power of art and creativity. On opening night, upon arriving at McCaw Hall, you’ll be greeted by searchlights and festive decorations. Walk the red carpet as our photographer snaps a photo, or simply take in the atmosphere. We hope you’ll join the conversation on Twitter and Facebook with #SORedCarpet and #MuseItOrLoseIt. The Tales of Hoffmann runs for seven performances from May 3 through May 17. For more information (and, perhaps fashion inspiration! ), visit seattleopera.org/hoffmann. I ordered this dress for my sister wedding and I was too scared that it will not come but they surprised me by sending the dress two weeks earlier thanks a lot the designer.